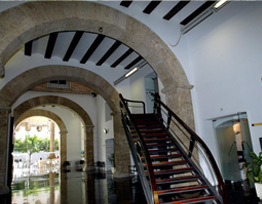 The workshop will take place at the Palacio Pineda of the Universidad Internacional Menéndez Pelayo (UIMP), located in the downtown historic center of Valencia. Here you can see a map of Valencia where the position of UIMP is shown. Click here for downloading a map with the walking directions to the Colegio Mayor Rector Peset, where the reception will take place, and the directions how to arrive at U.I.M.P.